The Breakers is located at One South County Road, just a 15-minute drive from Palm Beach International Airport. 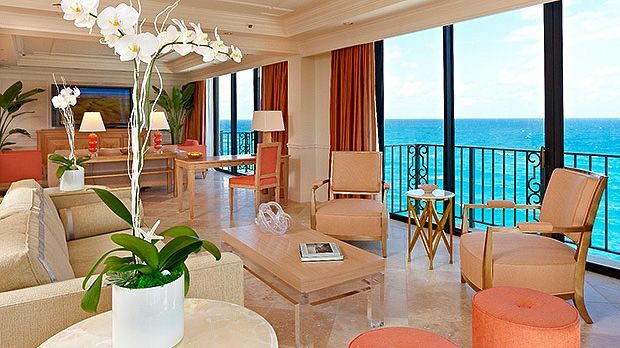 The Breakers sits on a picturesque oceanfront property in the heart of Palm Beach. This is one luxury hotel that is a legend unto itself, and guests know that every time they return, their expectations will be repeatedly exceeded. With a staff of 1,800 and hundreds of millions of dollars spent on continual upgrades and updates, there is no length to which this hotel won't go to ensure your stay surpasses previous experiences. The palatial atmosphere of The Breakers is understandable considering its history. In 1896, oil magnate Henry Flagler built his second Palm Beach Hotel "by the breakers." Fire struck the original building down in 1925, but Flagler's heirs went to work re-building it quickly and impeccably; the current structure was modeled after Rome's Villa Medici. It remains to this day as a Palm Beach landmark, where discerning guests dine at any of the 10 restaurants, swim the impressive pools, golf at one of two courses, and bask in Florida's many pleasures. Send an availability request with your requested dates to the The Breakers Palm Beach.